Should you require outside-the-box thinking, it would be hard to engage a more al fresco intellect than Chris Bangle. The internationally renowned designer now turns his hand to everything from Cognac to wearable electronics at his own studio, but he’s best known as the car designer who revolutionised the aesthetic of Fiat and BMW, as well as reinventing the Mini for the 21st century. “Our design philosophy is to treat different things differently – because they are different,” Bangle says. “But also to use the power of conflicting goals as the catalyst for innovation.” So when Sanlorenzo’s CEO, Massimo Perotti, had conflicting goals, who better than Bangle to look at his problem from a fresh perspective? “Sanlorenzo was thinking about realising a full-beam yacht but there were a lot of doubts about it,” Perotti says. Using the full beam would increase guest space but removing side passages would hamper crew movement through the boat, affecting service, mooring operations and generally making their lives more difficult (no trivial matter when retention of good crew is a major concern for owners). The routing problem is amplified on a yacht of just over 31 metres, with a relatively small crew – if they have to be everywhere at once, you can’t put hurdles in their way. Bangle had been engaged with Sanlorenzo in an exchange of ideas since 2015 and Perotti felt he was enough of an outsider to tackle this particular problem. 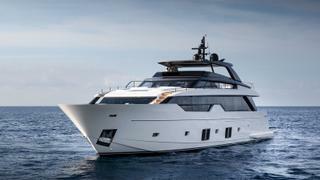 While Bangle has expressed respect for Sanlorenzo in particular, he has also described most yacht designs on the market as a “mess that look like six cars have been smashed together”. He certainly does not stick to any pre-conceived notions in this sphere. The designer’s solution? Make the yacht asymmetrical: a wide body design on one side, a side passageway on the other. Asymmetry has been seen in larger custom designs, but it has not been done on a yacht of this size or to this degree. “The idea lends itself to other sizes of course and in particular can be used as the springboard for a completely innovative design – as we proposed – or be retrofitted into a conventional design,” Bangle says. 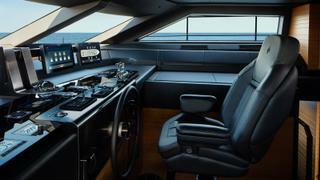 But there’s more to yacht design than sparks of genius. “The intuition of Chris was good but the difficulty was to translate it into a real project – Zuccon International Project, together with Sanlorenzo’s technical office, worked hard to create the SL102,” Perotti says. 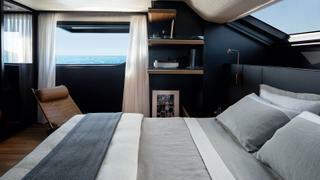 Bernardo Zuccon and his sister Martina penned the design, as well as the interior decor that can be seen on the first SL102, Le Gypsy, which debuted at the Cannes Yachting Festival last year. Or as Bangle puts it, “While an innovative design can be the most striking – and get the most out of the idea – for very traditional brands new ideas need to be introduced in smaller doses.” This meant that the exterior design could not flaunt the boat’s asymmetry (and this is a very asymmetrical boat). “One way is to visually ‘mask’ the asymmetry, by using the dark areas of gangways to complete the graphic image,” Bangle says. The designers maintained balance in profile by backing the one side passage with the same dark glass that clads the wide-body on the other side. From the aft or forward perspective, the difference is obfuscated by the matching shapes of the structural supports on both sides – it’s not uncomfortably obvious that one side’s supports cover an outdoor passage and the other is filled out with interior space. Inside, the value of this unusual design really shows itself, and not only in the extra 25 square metres of space gained over a yacht with two side passages. “So far as the interiors are concerned, the asymmetrical concept has overturned all the classic tenets of design and layout,” Zuccon says. 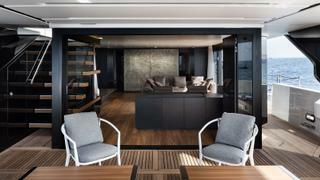 The design makes a feature of a staircase leading to the flybridge deck. 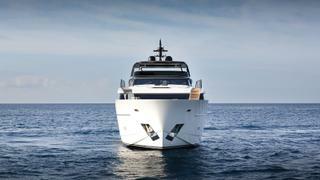 It cuts through the main saloon on the port side, where space is plentiful thanks to the full-beam design, and is sided in dark glass, like the sliding doors leading to the aft deck beside it. From the saloon, you can watch pedicured feet padding upstairs. It feels modern and, with the gloss of the dark glass, glamorous. Further inside, the saloon opens up in the most spectacular way. 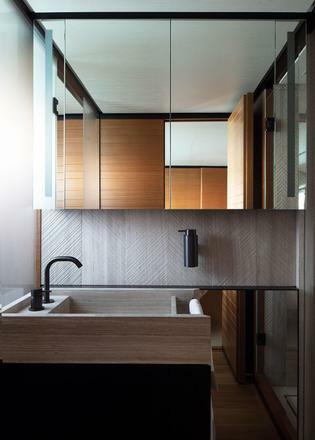 Laying aside the omnipresent seascape, the asymmetrical design lends a residential feel – as if the aim was just to create interesting spaces, rather than to make the most of pre-set spaces within a fixed container. From the aft deck, the layout creates a path through the saloon and forward to the bridge, where another set of stairs switchbacks up to the forward end of the flybridge deck. At the aft end of the same deck, those glamorous stairs lead back down to the aft deck. 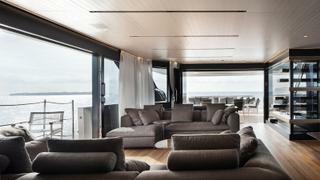 The owner’s suite, located on the main deck forward, has its own asymmetrical design. The space extends on the port side all the way to broad windows flush with the hull side, providing an ongoing relationship with the sea. On the starboard side, meanwhile, doors connect the owner’s cabin to the side passage that leads to a spacious bow lounge. The builder offers the option of a side passage gate, deployed at the touch of a button, to keep the entire forward area of the yacht a private space for the owners. To access the bow lounge the owner will not have to pass through a communal guest space. 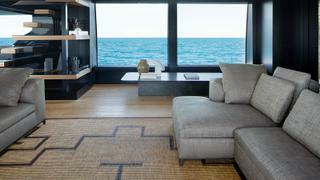 Zuccon’s studio designed interior decor for Le Gypsy to enhance the feeling of continuity that runs through the boat. “We decided to reuse the colour schemes found in the exteriors for the interiors too,” Zuccon says. 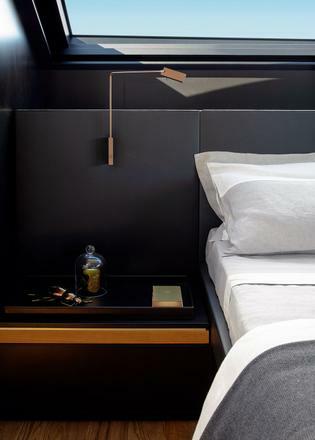 “Outside, we see the colour of the teak, the white fibreglass and the black glazed surfaces. 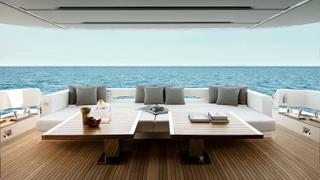 We have transferred this combination of three colours to the interiors too.” This includes teak that continues from the aft deck into the saloon, and black and white carried in from outside in the overheads. In the main saloon the tones are low-key, muted and cool, with taupe sofas by Antonio Citterio for B&B Italia that are designed for sinking-in, a low dark grey marble coffee table and at the forward end, two sliding panels in bronze by Giorgio Paolini, an artist from Rome who created them for the boat. As well as adding a burnished opulence, they hide the television. This design may feel bespoke but it can be replicated. Le Gypsy features twin 16V MTU M96 engines – plus a bank of lithium batteries to supplement the two generators – which can push the yacht to a top speed of 28 knots, but an M86 package is also available for (slightly) lower-key cruising, reaching a top speed of 26 knots. There are a couple of different layout options too. While the SL102 was only shown to the public in May 2018 during Sanlorenzo’s Elite Days, 11 units have already been sold and the production line is fully booked – the first delivery available will be at the end of 2020. 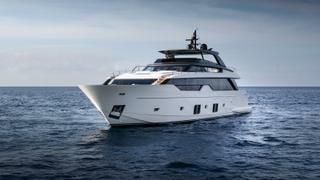 Another of the new SL102s, with interior design by American designer Marty Lowe, is making a show debut in the US, at the Miami Yacht Show in February. “The luck of the naval designer has always been to draw half a boat and then mirror it,” Perotti says. “With this boat the design path was more enterprising. It took longer but at the end we achieved a magnificent result, a creative idea that compared to a traditional layout, allows for more space, brightness, relaxation and better flexibility of use.” Who says you can’t have everything?